A website sales, marketing, and advertising message from Jim Warholic, president and founder of Professional Web Services, Inc. I thought I would share some of our thoughts about websites and website designs. Our website is designed with a bit of creative marketing style, colorful advertising, and web branding flair. It is not your typical, mundane, or even standard color scheme that might be found on the majority of websites online. “Why is your website this way?” you might ask. The short answer, is because we are different. There are many traditional looking websites and are a dime a dozen, but good sales, marketing, advertising, and branding; along with good customer service will be remembered and set apart from the rest with a good website design at the foundation. First impressions do count online. One of the impacts the Internet has had on businesses, is the fact that sales and marketing does not always begin with a customer speaking with a sales person. Sales and marketing has been turned upside down, and now begins at Google, Bing, and Yahoo, the top three search portals for finding the majority of what it is we as a society, collectively want. Let’s take Google Search for example. As I have said before, Google is more of your website’s home page than your home page of your own website. At first that seems a strange statement to make, but think about it for a moment; the majority of people coming to a B2B or B2C website, see the website online in the search engine results pages before they even click the link. I suspect you may not have thought of your own website in that way, but it really is the truth. If your business has millions of online visitors, like the Facebook, Twitter, or one of many news websites, you might have the website URL stored in your favorites or bookmarks to get to on a daily basis, but then again, maybe not. People don’t always bookmark web pages, and many times simply typing it in to the Google Search bar is the way to go. After all, it is much easier to type it in the Google Search bar than it is to type in the small URL navigation area at the top of your browser. So, once again we see, even with well known websites, the place where the website is seen first is the search results in Google to begin with. I like colors in a website design, yet, I like to be able to read the fonts easily, and I like something that is easy on the eyes for the long haul. When I go to a website, I want first and foremost the information to be available, in a logical progression, and for it to be concise, where it needs to be; yet the information should be detailed enough to explain what the heck is going on and to give the reader the option to read more or dive into the thick of things with more detailed understanding and explanations available. I want the information to flow. Yes, a website needs to be functional and logical to use. That process of bring the website up to high standards for communication purposes never ends. OK, let’s get back to basics in sales, marketing, and advertising on the Internet. Professional Web Services’ Internet marketing services is here to get your website found online in the search engine results pages. Contact us today for an online marketing services quote and start bringing in more qualified leads and an an increase in long term sales results for your business tomorrow. 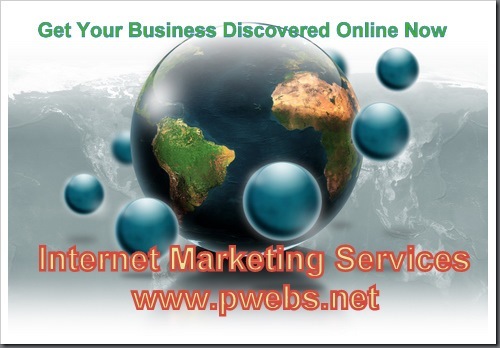 Get Your Business Website Discovered Online Today.